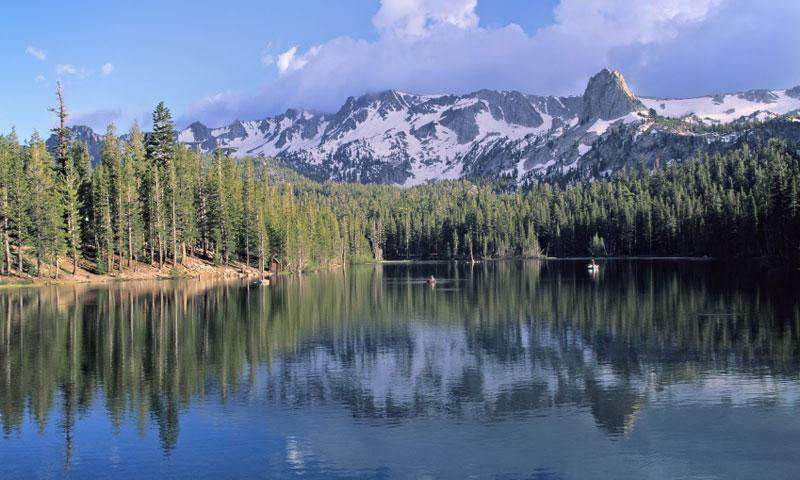 Visitors come to Horseshoe Lake, located just outside of town in the Mammoth Lakes basin, for access to abundant outdoor recreation activities including swimming, mountain biking, and hiking. Horseshoe Lake is located just outside of town in the Mammoth Lakes Basin. Explore the area on a mountain bike or spend the day hiking. Horseshoe Lake is the only lake in the area that allows swimming. Horseshoe Lake, located just outside of town in the Mammoth Lakes Basin, is the perfect place to enjoy the areas spectacular alpine scenery, as well as to enjoy outdoor activities such as hiking, swimming, and mountain biking. Horseshoe Lake is located just outside of town in the Mammoth Lakes Basin. From the Lake Mary Junction, travel 1.25 miles west to reach Horseshoe Lake. Due to heavy snowfall, Horseshoe lake is best visited from late May through early October. Horseshoe Lake is the only lake in the Mammoth Lakes basin where swimming is allowed. This 7 mile loop trail traverses both pavement and single track around the banks of Horseshoe Lake. The ride is a great introduction to Mammoth area mountain biking, and because it has minimal elevation gain, is great for riders of all ages. The Mammoth Lakes Basin is home to a variety of popular hiking destinations. The Horseshoe Lake Trail is an easy 1.5 mile introduction. For a longer trek, follow a trail all the way to Red’s Meadow and Devils Postpile National Monument. Since the late 1980’s, excess carbon dioxide rising from the area soil has been killing many of the tree’s surrounding the lake. Because of this, camping in the area is not advisable.